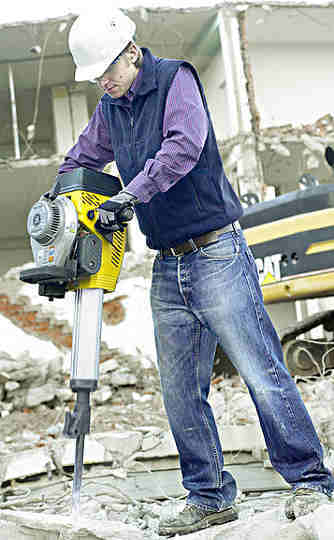 A type of impact breaker using electric power. In the larger sizes also known as an electric jackhammer. 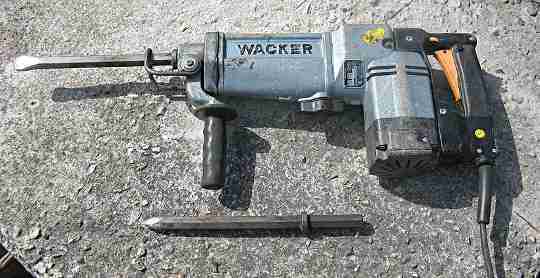 A full size pavement breaker of jackhammer that uses standard tools that is powered by a petrol engine. The breaker above I used for quite a long time. It is adequate for breaking up small sections of concrete and it is just about on the upper size limit of machines that can be used horizontally for cutting holes in walls. Where I live we use quite a lot of precast concrete walls and core-filled 200 series blockwork so a machine like this with plenty on power was good on many jobs. Often when working on walls it was hung from a rope thrown around a rafter or ceiling joist to take the main weight of the machine. The large Bosch above was called in to break up a heavily reinforced really hard bathroom floor. A few hours work that did not warrant the hire of an air compressor/jackhammer combination, but at the same time it was just too hard for the Makita above. 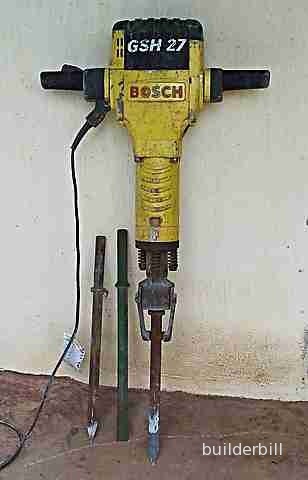 The machine above is a large rotary hammer drill that has an adequate weight and punch to be used for taking down sections of masonry walls. Easily hand held by one man.